Ever wanted to leave your friends stunned by your scientific knowledge? 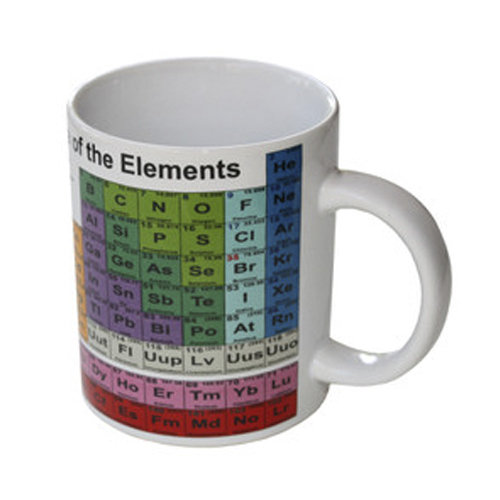 Now you can impress them by rattling off all the elements by simply glancing down at your periodic table mug. The astonished reactions you get will be almost as great a pick-me-up as the coffee itself. A fantastic office toy and desktop necessity to showcase your brainiac abilities. If you are looking for geek stuff to show off your inner nerd, then this periodic table mug is a awesome way to start. Go back to school over your morning cuppa with coffee mug featuring the periodic table of elements. An ideal gift for the science geek, teacher or keen student in your life. Study your chemistry notes over a hot drink. Microwave and dishwasher safe. Comes boxed.